May | 2013 | what? bread? I’m killing time with baking things I like because I’ll be getting on with other things like preparing for the LondonSurrey 100 mile bike ride if the weather ever gets better. Today is a rest day because I did 50 miles yesterday. Back to Dan Lepard’s Short and Sweet book and an interesting loaf with a bit of a punch to it, the black pepper rye bread. Black pepper, and in my case fennel seeds, he gives you the choice of fennel, anise or caraway, are added to the mixture, and it’s all topped off with poppy seeds. I have tried this once before and found that heating the coffee and the rye to boiling point means you get a really tough mixture and it doesn’t work too well. The good people over on The Fresh Loaf solved the problem years ago, which will teach me not to do the Googling before I get it wrong. Anyway, the recipe says “heat half the rye flour and the coffee until just reaching boiling”. DO NOT DO THIS. If it gets too hot and the mixture boils and is like polenta you’ve gone too far and you will need more water when you add the other flours, up to 75ml seems to be the quantity required. At least now I have the confidence to fix it when it’s gone wrong. If I did it again I think I might just use hot coffee and bypass the boiling bit. No-one seems entirely sure why you do it. I used fresh yeast rather than fast action yeast. 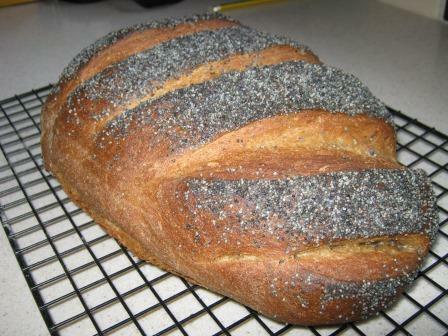 I used milk instead of egg wash and slashed after I’d put on the poppy seeds. Results – quite peppery, and browner than the book suggests. 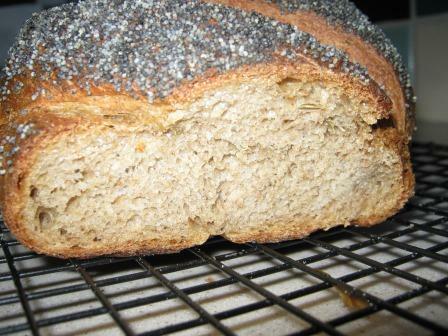 I used Bacheldre Watermill rye, maybe a light rye would not be so dark. It would be great with soft creamy cheese and/or smoked salmon as suggested by Dan. On the blog I wrote about pitta bread I linked across to The Yoghurt Book by Arto Haroutunian, which is a book I’ve had for a long time, and found useful for a range of dishes that use yoghurt. It includes a few recipes for breads and cakes, alongside main courses and desserts. 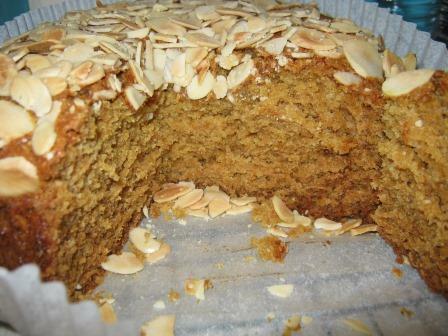 One that I haven’t made for donkey’s years is the almond gingerbread recipe. The book has been reprinted so I shouldn’t give you the recipe, but this could give you a flavour for the kind of straightforward recipes included and I haven’t found it anywhere else on the tinterweb so here goes. Oven set to 160C and you need a 7 inch square tin or 61/2 inch round tin, or any other size or shape you have. Grease and line, I use cake liners because I’m lazy. Weigh out and sift together the dry goods – 8oz plain flour, pinch of salt, 2 teaspoons ground ginger, 1 teaspoon bicarbonate of soda. Add 2oz ground almonds. Melt together 4oz margarine (or butter), 4oz golden syrup, 4oz soft brown sugar. Add to the dry goods with a pot of yoghurt and a beaten egg. Mix up nicely and then put in the tin and top off with 2oz of flaked almonds. Bake for about 55 minutes. Leave to cool in the tin for 15 minutes before taking out and leaving to cool. The result is a fairly close and generally quite moist cake, that can be used as a pudding with some custard when it’s warm if you’re that way inclined. I’m not a fan of treacle which finds its way into too many recipes that need brownness and stickiness and it is a taste I don’t particularly like. This is a great store-cupboard recipe which can be made quite quickly, and if you don’t have fresh ginger or lemon or any of the other things that seem to find their way into ginger cakes these days.